The human eye is a remarkable organ capable of producing our most precious of senses. The eye can function in a wide assortment of lighting conditions ranging from a dark moonless night, to the brightness of a summer day. Even within this incredible range of luminance, the eye can detect a single photon of light. More than just a camera, our eyes allow for perception of motion, color, depth, and detail –all at different distances, speeds, and lighting conditions. While a finely-tuned eye that is free of disease is capable of generating our most remarkable of senses, the eye is vulnerable to a wide variety of ailments which can impede its function of our visual system. Understanding the anatomy of the eye allows us to appreciate how these various ailments can affect the function of the eye, and more importantly what we can do to prevent disease from affecting our own eye health and, consequently, our vision. Lids– The eyelids are responsible for maintaining the health of the cornea and conjunctiva, spreading our tears evenly across the ocular surface, and keeping the front surface of the eye free of debris. If the eye is our body’s camera, the lids are the lens cap and cleaning cloth. The lids themselves have a very important role in producing the oil found in the outermost layer of the tears. This oil is produced by Meibomian glands which help prevent the warm tear layer from evaporating off the front surface of the eye. When the oil glands are inflamed or clogged, Meibomitis is the result. It has recently become understood that meibomitis is the most common cause of dry eye. The eyelashes project from the upper and lower lids, shading the eye and keeping debris from falling into it. Blepharitis is a common ailment of the lids, and occurs when bacteria, or other microorganisms, overpopulate along the base of the lashes. Conjunctiva– The conjunctiva is the transparent skin that lines both the inside of our upper and lower lids, as well as the eyeball itself. This tough, outer coating of the eye is quick to heal after trauma or infection. Infection or inflammation of this tissue is known as a “conjunctivitis” and frequently results in the eyes appearing red, or bloodshot. Often times, a bloodshot eye indicates either an infection, inflammation, or the presence of a foreign body in the eye. Infection can result from bacteria, virus, fungi, or protozoa, and such cases of “pink eye” should be quickly addressed to prevent complication. Other causes of conjunctivitis include dry eye, allergies, meibomitis, and blepharitis. Sclera– Our eye’s main support structure is a spherical structure called the sclera. The sclera is a strong, leathery tissue that reinforces the shape and integrity of the eye. The sclera is typically white in appearance, though inflammation of the sclera (known as “scleritis”) can make the sclera appear pink or red in color. A scleritis is frequently caused by systemic auto-immune disease such as arthritis or lupus. Any discoloration of the sclera, or deep boring pain of the eye, should be investigated quickly in order to receive prompt treatment. Cornea– Probably the most remarkable tissue in the eye is the avascular (without blood vessels) cornea. The cornea is the powerful refracting lens at the front of the eye. It is an incredibly delicate, finely-tuned optical structure that provides the transparent front surface of the eye. The cornea is the most sensitive part of your entire body (when you get an eyelash in your eye, it is your cornea that makes you freak out and work to remove it). Disease of the cornea is serious because any lasting scars will compromise the cornea’s transparency, and thus ability to function optimally. A variety of genetic conditions exist which can alter the shape of the cornea and often impede its function, the most common of which is keratoconus. Keratoconus is a progressive thinning and steepening of the cornea that requires special contact lenses for adequate treatment in many patients. The cornea is also the structure that is reshaped with an ablative laser in such surgical procedures as LASIK and PRK. Iris– The iris is the colorful membrane that regulates the amount of light that reaches the back of the eye. The iris’ job is to expand and contract as needed to regulate light reaching the retina. This feathery structure is controlled by our third cranial nerve, and the function of the pupils often tell us much about the health of our nervous system. Damage to the iris from trauma or surgery can affect our eye’s ability to see comfortably in bright environments. Lens– Our natural lens, known as the “crystalline lens,” sits right behind the iris near the front of the eye. The lens is living tissue, and similar to the cornea, has to be transparent in order to function properly. When the lens is oxidized over time, it will yellow into a cataract. Cataracts are a disease that tends to occur in older patients, as older patients have been exposed longer to the ultraviolet and blue light that causes the oxidative damage. To prevent the typical form of cataracts, a diet that is rich in antioxidants is helpful, as is wearing protection from shorter wavelength light (both ultraviolet and blue light). Some patients can be born with congenital cataracts, and others will develop cataracts at relatively young ages. Cataracts also occur earlier in diabetics, patients that smoke cigarettes, patients that have suffered eye trauma, and patients with a history of steroid use. Vitreous Body– The vitreous is the thick gel that fills the posterior segment of the eye. This gel carries nutrients, provides structure to the eye, and creates the eye’s pressure (also known as “intraocular pressure” or “IOP”). Just as blood pushing on the blood vessels which contain it create a bloodpressure, the vitreous pushing on the outer walls of the eye creates an eyepressure. When eye pressure is too high, glaucoma can result. The vitreous has several attachment points in the eye, including an attachment at the optic nerve. When the vitreous pulls forward away from its attachment points, a posterior vitreous detachment can occur which results in patients perceiving a “floater,” or “cobweb” in their vision. To avoid possible retinal complications, posterior vitreous detachments should be seen immediately. Retina– Photons of light are focused by the cornea and lens and arrive at the back of the eye at the retina. The retina is the thin, nervous membrane that detects light. The retina senses light and reports that information to the brain via the optic nerve (the second cranial nerve). Many diseases can affect the retina including glaucoma, retinal detachment, retinal hole, and retinal tears. Other diseases of the retina include diabetic retinopathy in which diabetic disease compromises the retina’s ability to receive oxygen. When eyes are dilated, it is mainly to view the retinas in order to rule out disease. Optic Nerve– The retina communicates with the brain via the optic nerve. This structure is located at the back of the eye and actually represents a blind spot in a patient’s vision. The optic nerve can reveal much about the health of the back of the eye including aiding in the diagnosis of multiple sclerosis or other brain disease. Glaucoma is a disease that manifests at the optic nerve. Glaucoma causes the progressive loss of peripheral vision and can typically be successfully managed when diagnosed early. Macula– Our most sensitive vision, our central vision, is brought to us by the part of the retina known as the macula. 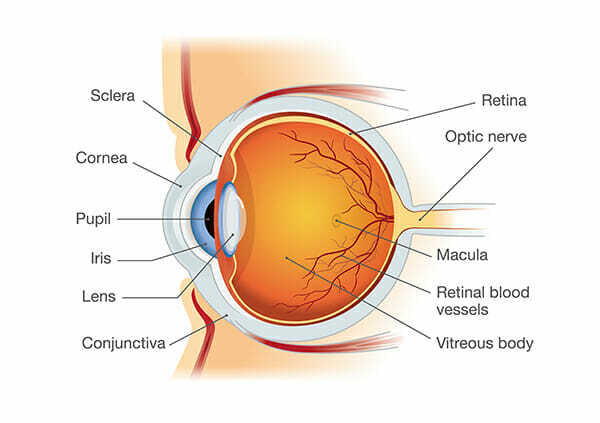 The macula is a small region of the retina, but it holds the highest concentration of photoreceptors, the cells that detect light and report that visual information to the brain. The macula can be damaged by ultraviolet and blue light exposure in those patients with reduced macular pigment optical density (MPOD). Patients with low MPOD tend to get macular degeneration more severely, and earlier, than those patients with higher MPOD scores. The macula can also be affected by diabetes and the use of certain medications such as hydroxychloroquine. Retinal Blood Vessels– A great deal of blood is required by the retina to support its high metabolism, and a branching network of arteries and veins enter the eye at the optic nerve, nourishing the retina. Our retinal blood vessels can be affected by diabetic retinopathy, hypertensive retinopathy, and cholesterol plaques. Early diagnosis and proper systemic health management are key to controlling these diseases. The eye is unique in that it is the only part of our body where living blood vessels can be easily viewed, and their health assessed.